Aleksandr Pushkin is ranked as one of Russia's greatest poets. He not only brought Russian poetry to its highest excellence, but also had a great influence on all Russian literature in the nineteenth and twentieth centuries. Aleksandr Sergeevich Pushkin was born to Sergei and Nadezhda Pushkin on May 26, 1799. On his father's side he was a descendant of Russian nobility. On his mother's side he was related to an African lord. But by the time Aleksandr was born, the family had gradually lost most of their wealth and influence, and they were lowered to the position of minor nobility. Aleksandr's family life was far from ideal. His father was domineering and easily irritated, and his mother often left the young child alone in pursuit of her social ambitions. Between 1811 and 1817 Pushkin attended a special school for privileged children of the nobility. Pushkin was not a very good student in most subjects, but he performed brilliantly in French and Russian literature. After finishing school, Pushkin led a wild and undisciplined life. He wrote about 130 poems between 1814 and 1817, while still at school. Most of his works written between 1817 and 1820 were not published because his topics were considered inappropriate. In 1820 Pushkin completed his first narrative poem, Russlan and Ludmilla. It is a romance composed of fantastic adventures but told with the humor of the previous century. 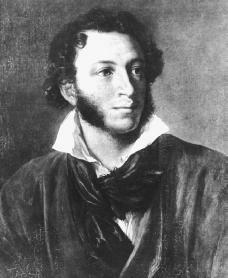 However, even before Russlan and Ludmilla was published in June 1820, Pushkin was exiled to the south of Russia because of the political humor he had expressed in his earlier poems. Pushkin left St. Petersburg on May 6, and he would not return for more than six years. Pushkin spent the years from 1820 to 1823 in various places in the southern part of Russia, including the Caucasus and in the Crimea. He was happy there at first, but later, he felt bored by the life in small towns and took up again a life of gambling and drinking. He was always short of money. He worked as a civil servant (government worker), but did not make much money and his family refused to support him. his wealthy friends. In 1823 he was transferred to Odessa, a larger city more to his liking. Then he moved to Mikhailovskoye, an estate owned by his family. When Pushkin arrived at Mikhailovskoye, his relations with his parents were not good. His father was angry at him. The family left the estate about mid-November, and Pushkin found himself alone with the family nurse. He lived alone for much of the next two years, occasionally visiting a neighboring town and infrequently entertaining old Petersburg friends. At this time the nurse told Pushkin many folk tales, and it is believed that she gave him a feeling for folk life that showed itself in many of his poems. Pushkin's two years at Mikhailovskoye were extremely rich in poetic output. Among other works, he wrote the first three chapters of Eugene Onegin, and composed the tragedy Boris Godunov. In addition, he composed many important lyrics (poetic dramas set to music) and a humorous tale in verse entitled Count Nulin. Pushkin was eventually forgiven by the new czar (Russian ruler), Nicholas I (1796–1855). The czar promised Pushkin that all of his works would be censored (edited for approval) by the czar himself. Pushkin promised to publish nothing that would harm the government. After some time this type of censorship became a burden for Pushkin. Pushkin continued to live a wild life for awhile, but wanted to settle down. He proposed to Nathalie Goncharova in 1830. He asked his future in-laws for money and convinced them to provide him with land and a house. He continued to work on Eugene Onegin, wrote a number of excellent lyrics, and worked on, but did not finish a novel. Eugene Onegin was begun in 1824 and finished in August 1831. This is a novel in verse (poetry) and most regard it as Pushkin's most famous work. It is a "novel" about life at that time, constructed in order to permit digressions (the moving away from the main subject in literary works) and a variety of incidents and tones. The heart of the tale concerns the life of Eugene Onegin, a bored nobleman who rejects the advances of a young girl, Tatiana. He meets her later, when she is greatly changed and now sophisticated. He falls in love with her. He is in turn rejected by her because, although she loves him, she is married. After 1830 Pushkin wrote less and less poetry. He married Nathalie Goncharova in 1831. She bore him three children, but the couple were not happy together. His new wife had many other admirers. He challenged one of her admirers to a duel that took place on January 26, 1837. Pushkin was wounded and died on January 29. There was great mourning at his death. Many of Pushkin's works provided the basis for operas by Russian composers. They include Ruslan and Ludmilla by Mikhail Glinka (1804–1857), Eugene Onegin and The Queen of Spades by Peter Ilyich Tchaikovsky (1840–1893), Boris Godunov by Modest Mussorgsky (1839–1881), and The Golden Cockerel by Nicolai Rimsky-Korsakov (1844–1908). Feinstein, Elaine. Pushkin: A Biography. New York: Ecco Press, 2000. Magarshack, David. Pushkin: A Biography. London: Chapman & Hall, 1967. Simmons, Ernest. Pushkin. Cambridge, MA: Harvard University Press, 1937, revised edition 1971. Vickery, Walter. Pushkin: Death of a Poet. Bloomington: Indiana University Press, 1968. Vitale, Serena. Pushkin's Button. Edited by Ann Goldstein. New York: Farrar, Straus, and Giroux, 1998. What were the names of Aleksandr Pushkin's 3 children?